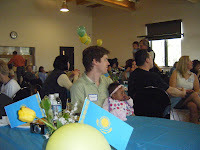 Last Sunday Lexie and I drove up to north of Seattle to participate in the SPOON Seattle Kaz Family Gathering. 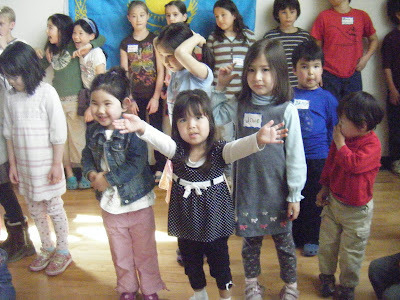 It was well worth the trip just to see so many smiling Kazakh faces. 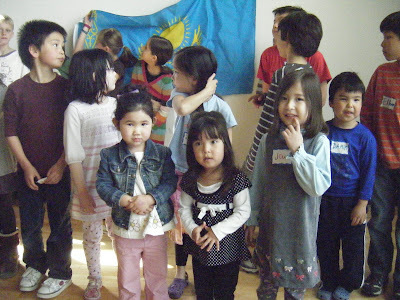 I realized when I was standing in the registration line watching all these beautiful Kazakh children running around that I "know" a lot of Kazakh children on line but Lexie and I don't actually interact with any, so it was just an amazing experience in and of itself. 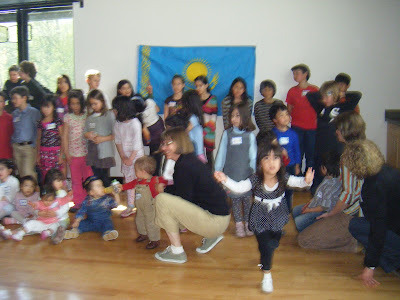 As you can see there where all ages represented as well as some adult Kazakh nationals and I met a set of twins that their mom was proud to say where American born Kazakhs! 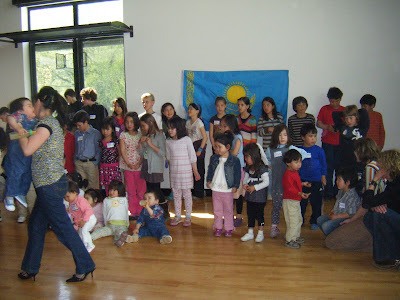 It was set up so that the 40+ families could get to know each other for the first hour while enjoying goodies and the playground at the community center. 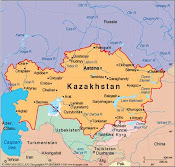 It was great to exchange stories with a few parents about our experiences in Kaz and the children's adjustments once they where home. It was nice not being an oddity when someone asks me about my child. Normally it's someone subtly (or not so subtly) trying to figure out what nationality Lexie is, when I'm asked where she's from. But with this group of families they where just wondering what region she was born and if it was where their child was from. And exchanging baby house and agency information was also great. My only complaint was that the social part was way too short. I really didn't get a chance to meet nearly enough families. But Lexie jumped right in, big surprise, and met "Big Girl Jane" right away. Soon Lexie was following her around everywhere. 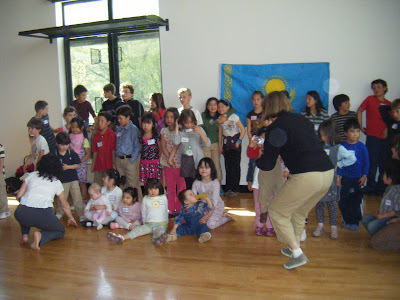 Here she is during the group picture with her new best friend Jane (who is 4 1/2) in the blue dress to Lexie's left (picture right) and Meeka (I think was her name) the adorable girl with curly hair pulled up in a ponytail to Lexie's right who just turned 4. Aren't they cute!!! Unfortunately my camera hog daughter decided to be shy and nervous and didn't want to do the group photo. Here she is feeling insecure. And here she is seconds before they took the group photo running OUT of the picture. So she won't be in the picture they have on their site about the gathering. But as you can see we were there. She just found that one shy moment she has been blessed with and decided to express that. 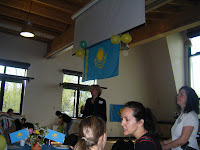 After the pictures they started the presentation about what their organization does for the orphans of the world. It's simply wonderful and rather pennant. For the full explanation (and if anyone would like to donate to this amazing cause) their website address is http://www.spoonfoundation.org/. In a nutshell their mission is "to improve the health of international orphans and adoptees by providing them with the nutrients they need to grow and thrive." They are working with a number of renowned International Adoption physicians including Dr. Julian Davies from the IA Clinic at the University of Washington where I take Lexie. He was the key speaker for the day and a wealth of information on both the need for these children to receive vitamins to help supplement what they receive at the baby houses as well as the need for adoptees to receive proper nutrition once they come home to the states. 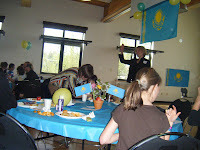 Plus the Kazakh moms who were so moved by what they saw while adopting their children in Kazakhstan that they started this foundation where there to explain more about their plans for the growth of the organization and their dreams for the improved health of all children who unfortunately have been sentenced to a childhood growing up in an institution no matter how well meaning the caregivers at the baby & children houses are. So take a minute to go to their site and maybe donate a little something to a cause that is as basic as better nutrients for orphan children. 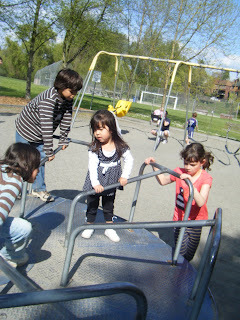 Okay I'm off my soap box (for now) and on to say that after the presentation we had a chance to enjoy a little more fun on the playground before heading home. 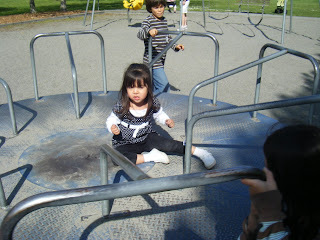 Lexie LOVED the old fashions merry-go-round. The older Kazakh kids on the playground that were also enjoying some last minute playtime before their long ride homes, were very sweet with Lexie and didn't go TOO fast. And it was too fast for Mommy but not for Lexie!Of course we couldn't leave the playground without taking a ride on the swings. 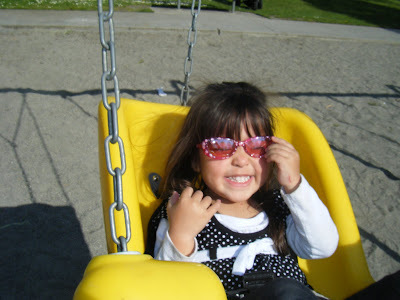 And she really liked the big yellow swing.